“The Waiakea High School robotics program is an exceptional educational opportunity for these students and it well-deserves the support of TMT,” said Dawson, TMT’s site studies manager. Governor Linda Lingle was also present for the presentation ceremony. “TMT also is very pleased to join with Governor Lingle in recognizing this program, which will continue the development of these future scientists and engineers,” said Dawson. The robotics program, developed by Waiakea High School, is unique not only in Hawaii but throughout the United States in secondary schools. It is designed to help prepare students for college and for successful careers in engineering, science, and technology by giving hands-on experience. The program centers on designing, building, and programming a team of robots. It also seeks to develop leadership, teamwork, and project management skills that will prepare students for the future workforce while being measured against a global standard through competition and collaboration. “TMT's financial support of the micro-robotics program will be a major boost to Hilo’s robotics efforts and our ability to compete locally, statewide, and internationally,” said Olive. The Waiakea High School grant is the first of three high-technology awards totaling $85,400 being made by TMT for various educational activities on the Island of Hawaii. TMT’s other awards include $20,000 for the RoboFESTival Scholastic Robotics Competition and Science/Engineering Fair (RoboFest) managed by the University of Hawaii’s Institute for Astronomy, and $34,500 for the Hawaii Island Akamai Program. RoboFest Hawaii is a competition that frames robotics challenges with real science taking place on Hawaii Island. It was created to offer accessibility to robotics competition to the local community. The Akamai Internship Program offers community college students and undergraduates who are attending college in Hawaii or who are from Hawaii but studying on the Mainland an opportunity to get involved in high-tech research and industry. Each student is matched with a mentor and is integrated as a member of the mentor's group with daily guidance. TMT considers education a key part of its mandate and is making these awards to recognize the exceptional work that is being done on the Island of Hawaii in science, technology, engineering, and math education. 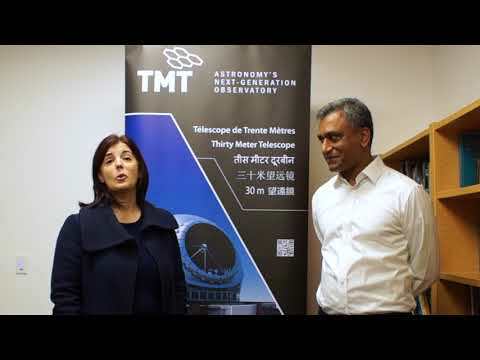 TMT is a partnership among the University of California, California Institute of Technology, and ACURA, an organization of Canadian universities. The Gordon and Betty Moore Foundation has provided $50 million for the design phase of the project and has pledged an additional $200 million for the construction of the telescope. ACURA committed an additional $17.5 million for the design and development of TMT.